Did you know that a properly installed gutter system built with quality materials could extend the life of your roof by years? Live Oak Construction is the residential roofing Houston experts with the expertise to design and install the right gutters for your home. The proper flow of water and debris away from your roof is essential to its health. If leaves and debris build up in your Houston gutters, it can lead to water damage, which endangers the structural integrity of your home. The Houston gutter system experts at Live Oak Construction have been creating quality, durable gutter systems for homes in the Houston area since 1987. 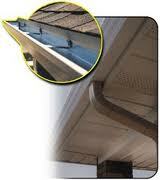 Our gutters are properly sized and configured to collect and direct the flow of water safely away from your home. This includes installing durable, seamless gutter troughs that are securely fastened to your home, along with wide downspouts that accommodate the heaviest flow all year long. With a properly installed and quality made gutter system, your home will be protected from water damage and you will have the peace of mind of knowing that your gutter system is working at full capacity. Call Live Oak Construction today at 713-991-2667 to schedule a FREE in-home consultation and estimate for your Houston gutters.